Carry your BOSS G15 or G21 Polisher and accessories around style with the Griot’s Garage Detailer’s Bag! 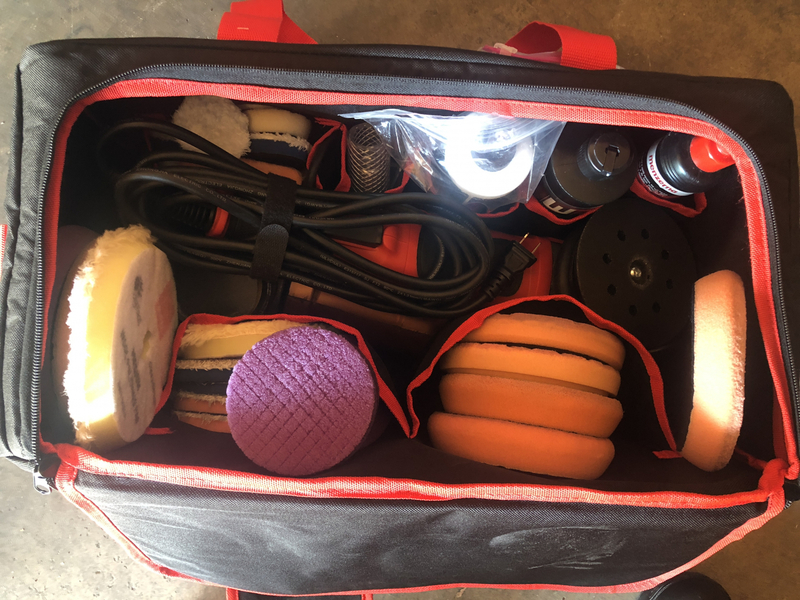 Griot’s Garage Detailer’s Bag was designed with the BOSS System in mind. 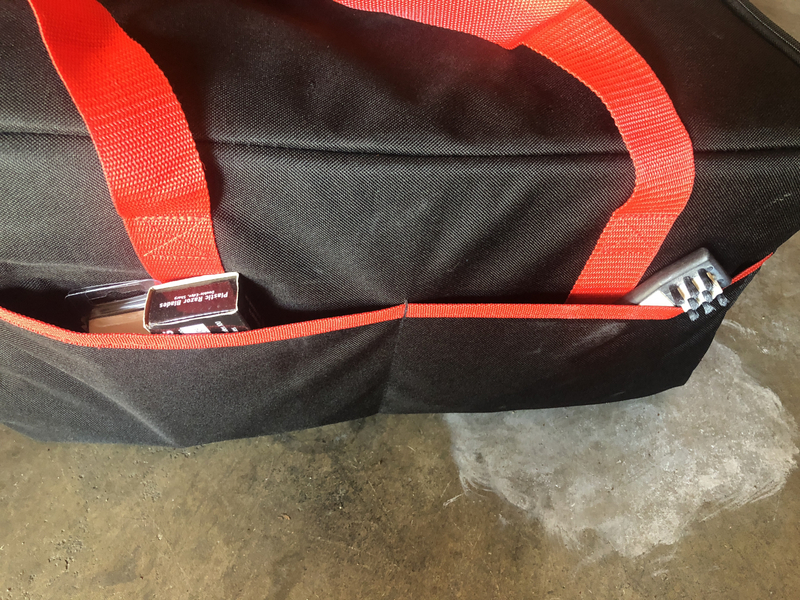 Made to carry your new BOSS polisher as well as the extras you’re sure to have, the Griot’s Garage Detailer’s Bag is the only bag you’ll need when on the go with your Griot’s detailing arsenal. The heavy duty design of the Griot’s Garage Detailer’s Bag is made for both convenience as well as comfort. Constructed with a durable 600 denier nylon fabric, it’s able to tote your BOSS G15 or BOSS G21 polisher, four 16 oz. bottles, their corresponding pads, and at least a dozen of your most plush microfiber towels! The padded strap and padded handles ensure you won’t feel the burn after a long day of detailing and carrying your supplies around. The attractive black and red coloring of the bag boasts the signature Griot’s Garage decal, telling the world that you’re using one of the best products out there. The interior of the Griot’s Garage Detailer’s Bag has the perfect set-up; separate pockets for your microfiber towels, Griot’s Garage BOSS Buffing Pads, and your products, as well as a polisher seatbelt designed to keep your polisher in place in transit. If your bag takes a tumble, rest assured that your BOSS G15 or BOSS G21 will be safe! You’ve already upgraded your polisher, isn’t it time to upgrade your polisher’s bag as well? Griots Garage BOSS G21 Long-Throw Orbital Polisher Free Bonus! This bag does what I need it to. Sturdy and durable materials. 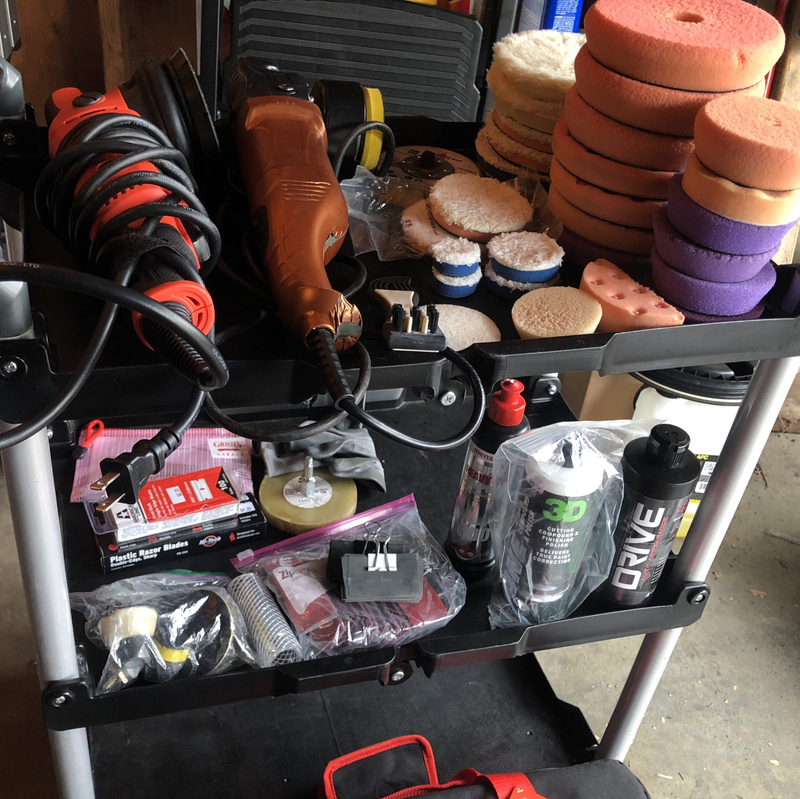 I run a condensed mobile detail rig and this is perfect for getting everything I need done on jobs. From headlights, emblem removal, to applying an AIO or doing paint correction, it holds my 3 types of polishes, 2 polishers, good amount of 5 inch pads to get a 2 step paint correction done, 3 inch pads, as well as 2 & 1 inch along with its adapters. Truly an all in one carrying bag! Great bag to take with to car shows. It fits great in the back of my C7 Z06, and allows me to take everything I may need. I do with the pockets inside were a bit different size, but overall a great bag for my detailing stuff. ProsGreat storage and mobility for my detailing stuff... and it does look cool as well. ConsInside pocket dimension may not fit all the particular bottles you may want.